The palates of the public are ever-evolving. Mouthfeel, taste and color are extremely important, but it would be wrong not to consider the power of the ear. The sound a snack makes when a bite is taken is vital to enjoyment. It could be a sign of the times. "Crunch is a very complicated textural attribute in prepared foods," says a spokesperson for the Almond Board of California, Modesto, Calif. "To many consumers, crunch is even more important than taste. But, getting the right level of crunchiness requires not only superb control of the manufacturing and packaging processes, but also a deep understanding of the underlying physics and chemistry, for they govern the mechanical attributes and the ultimate crunchiness of the components. "Furthermore, it is important to ensure that the crunchiness is delivered consistently every time the consumer bites into the product under consideration without negatively affecting the shelf-life of the food product or its nutritional profile," says the Almond Board. "The economy makes me want to crunch more," laughs Helen Simpson, senior business scientist and manager of global sensory at Ingredion Inc., Westchester, Ill. "When I think about a crunch bite, there is a hearty and robust feel to that. There is great satisfaction in biting and hearing that sound. "It is a tension reliever and fulfilling, it has stress relief and it is definitely very clearly a crunch," she continues. "It tends to be dense, louder and lower pitch." In its recent white paper, the Almond Board of California said global product launches with a "Crunch Claim" nearly doubled since 2007 when there were 2,129 products touting crunch. In 2010 there were 4,149 such products. "Almonds offer something no other nut does: the most highly rated crunch factor for consumers," the Almond Board says. "Whether whole, crushed, slivered or sliced, the texture and versatility of almonds offer endless opportunities to provide consumers with a superior crunch experience. This crunchy quality also is being promoted more on product packaging to differentiate products with almonds from product without almonds, proven by product launch activity." Snack makers know the consumer is always right. But do the consumers always know exactly what they are talking about? There is a definite consumer expectation from a snack before the first bite is taken. It may be the snap of a pretzel or the softer crunch of a buttery cracker topped with a cheese spread. Consumers can’t always verbalize what they desire as the sensory effect. "If you ask one hundred consumers if a product is crispy or crunchy and make them pick one or the other, 50 will say crunchy and 50 will say crispy," Simpson says. "The 50/50 split holds true if you ask one thousand or one million consumers." This dilemma led Ingredion to creating a new category (and word) – "crinchy." 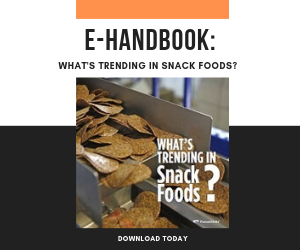 The company's consumer research led researchers to defining this new snacking area that fits between the crispy and crunchy categories. "An example in the cracker category is that we found the sound expansion is related to the different texture of the product," said Chris Thomas, principal technologist/global bakery and snacks applications at Ingredion. The starches employed in the baking process will yield the level of crunch, he said. "In the baked potato chip area, the higher rate of expansion just ended up having a crispier texture," Thomas says. Ingredion has even created a dictionary. Its Texicon is a food texture language employed to integrate consumer terms such as "creamy," "luscious" and "crunchy" to describe the texture experience of foods. Using the Texicon language, Ingredion says, will allow its staff of sensory experts in rheology and materials science to translate those visual, audible and oral consumer terms into fundamental expert terms that can be quantified for intensity, such as mouthcoating, viscosity and graininess. TIC Gums, White Marsh, Md., has a similar dictionary, although it's more heavily weighted toward texture. "Texture Lexicon" is part of the company's Texture Revolution program. The word list is extensive and addresses important texture-related issues through the entire sensory experience, starting with sight and ending with mouth clearing or coating with other terms that describe the entire eating or drinking experience. The Almond Board of California appears to agree. "Texture descriptions have become more elaborate, with the increasing use of superlatives to convey the ultimate texture experience." "Crunchy," for example, has to be "extra crunchy" or "super crunchy" or provide the "ultimate crunch." Texture descriptions also are receiving more prominence on packaging with visuals and increased size of texture-evoking words. In regard to almonds, various texture cues are being employed, including: Elaborate crunchy/crispy claims; the use of almond visuals (whole almonds, slivers, crushed) on product packaging; "almond crunch" as a flavor in its own right; almonds as an integral ingredient for many clusters; the increased use of whole almonds for more mouthfeel; and products are claiming to contain specified percentages of almonds. Choosing a snack may be a snap decision for consumers. It sounds like it is an ever-evolving science for food processors.